The Blogger's Quilt Festival is being hosted by Amy of Parkcitygirl- it's going to be great fun to see all the quilts on display, I'm just afraid that I'll find it TOO inspirational! My latest finished quilt is the Amethyst Matrix, the 2nd one I did for Amy's quilt along, the zigzag quilt. I did a zigzag quilt first, the Morpho, and then I needed another one to finish covering the foot of our bed, where the cats all hang out. So I laid this one out differently and just love it. The Nosey Parker seal of approval, even if it's in the rocker instead of on the foot of the bed. This was the 4th quilt I have finished. I started in March with the Oh,Fransson quilt along, the Mod Sampler. Then I participated in the Old Red Barn Quilt Along and while my attempt at using too many different bright fat quarters didn't work out, it forced me to find an alternate use for all those strips and I came up with a coin stack quilt which taught me a lot. It's the Lemonade quilt, for several reasons you can read about if you'd like to. After that, Amy's zigzag quilt and now we're working on John's (QuiltDad) Wonky Log Cabin quilt. Soon, we're onto circles! This quilting stuff is addictive! Susan, I really love this quilt! the colors are so fresh and crisp, and the quilting finishes it off perfectly. So does Nosey Parker. What a cutie! I can't believe it's only your fourth quilt. Fantastic quilt! I love how the dark and medium values make you either see the squares on point or within. The whole quilt and colourway are fantastic! you are so clever! Yeah, me too. Love how you laid this out. So so nice!!! It is ridiculously easy to get hooked on quilting, all it takes is one block :) Your alternate layout and the colors are wonderful. The white cat seems to be the perfect quilt accessory. Thanks for sharing your quilt's story. Each one you make I think is my favorite, then along comes another. You certainly have an eye for color and putting them together! Did you check out the new project I sent you?? 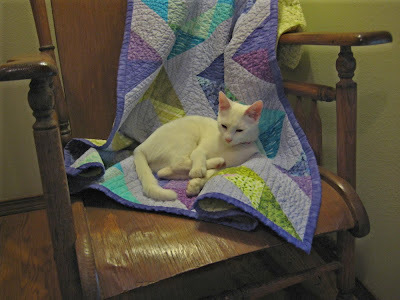 Love the color blending in your quilt! 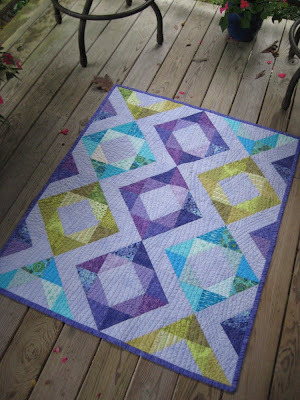 I love it - beautiful colours and the quilting is fabulous. This is absolutely gorgeous! I love the color scheme and the layout of this. I think it's my favorite so far of all the quilts I've looked at in the festival. Great colors and lay-out! I'm really liking this one! This is a very attractive quilt. I love the colors in it. And of course it looks spectacular with kitty! Beautiful quilt! Love the quilting. Oh, I like this. The colors blend beautifully. And I'm glad it has your cats' seal of approval! I am still working through all the quilts and love this one! It is a beauty.